What #Who Pocketed from Public Procurement? 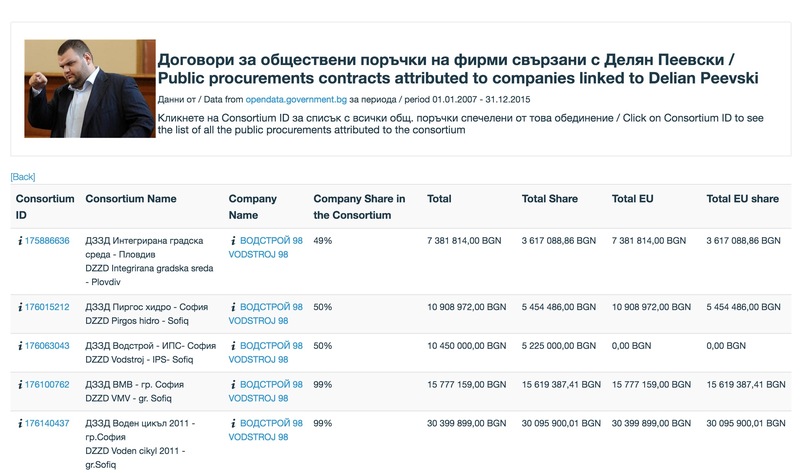 At the end of 2015, Bivol made estimates for contracts won by companies close to Peevski (see here). This was made possible thanks to the open data of the Public Procurement Agency provided by the government’s portal opendata.government.bg. For this purpose Bivol’s team built a special search engine that summarizes the data and allows users to filter them according to specific parameters. The publication of these data unleashed interesting dynamics. An order of Prime Minister Boyko Borisov triggered mass cancellation of major public tender contracts because of “lingering doubts” that the successful bidders are associated with Delian Peevski, the boss of Lukoil Bulgaria, Valentin Zlatev, and other oligarchs. “I checked somewhat who’s who,” said Borisov himself, thus confirming the “lingering doubts”. This process is not complete and every day we learn about more and more, canceled contracts albeit for smaller amounts. The initial data, published by Bivol, showed that just with one company – Vodstroy 98 – Peevski won alone or in consortia contracts for nearly 1 billion levs (see here), while the peak of the successful bids occurred at the end of the term of the first government of Boyko Borisov and its successor -the socialist-endorsed government of Prime Minister Plamen Oresharski. Not all consortia, however, are composed exclusively of companies of Peevski. Therefore, we continued our work on the data to refine the share of each company in each consortium and to calculate the funding received according to this share. We limited our interest to companies for which there is public information from several sources about their connection with Peevski: journalistic investigations and the list of assets presented by the former CCB majority shareholder, Tsvetan Vasilev, in an interview for BIT TV and about which the banker claimed that they were awarded public contracts due to Delyan Peevski’s influence. These include the following companies: Vodstroy 98, Industrial Construction Holding, Technoexportstroy, Transstroy, Infrastructure Company, Integrated Road Systems and PST Group. The equation does not include bids won by a particular company before it passed under Peevski’s control. Against the backdrop of these huge sums, all of the above companies have huge debts to the “late” CCB, and some of them have been transferred to First Investment Bank (FIB). These facts do not speak of a sustainable business model and value creation, but rather of a well-organized robbery. They also add even more specific evidence that European funds are actually used to finance the Bulgarian mafia. The result we are presenting to the public today will be sent to OLAF as a tool to identify and examine specific procurement before its possible their revision.